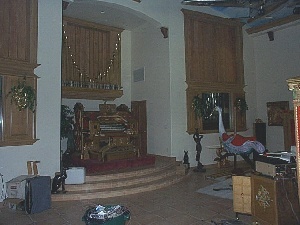 The Chicago Stadium Barton Console is once again controlling a pipe organ, but this time with a fully operational combination action in the residence of Phil Maloof LAS VEGAS, NV! I believe this is the largest free standing theatre organ console, at least it is the largest console I've ever "sam'd" (Syndyne'd) and wired. I literally lived in the console for the past 3 weeks. Really quite comfortable to work inside this thing. The only thing missing was a TV and Ice Machine. There are 6 manuals and Pedal; Accomp (and Acc 2T) Great, Bombarde, Jazz, Orchestral, and Solo. The sounds that come from this organ now are unbelievable! With all the added couplers, total unification of just about every stop at every pitch on every manual, plus all mutation couplers, WOW! what possibilities. Kay MacAbee will have a ball! Chris Gorsuch did the re-spec. of the console for the Maloof organ. On the Stadium Console, we ended up with 745 SAM's (Syndynes), plus a bunch of control buttons and switches for reit's celestes off, reversibles, combination action memory controls etc.bringing the stop count to just under 800 stops. There are 131 combination action pistons with as many combination action memories as you want (the only limit is disk space). The system is set up for 64 organists (directories), each with an unlimited number of combination action files. PLUS, the original 3-manual barton is also still on line along with the Stadium console. Duets really aren't possible because the organists cannot see each other the way the consoles are installed. Both consoles may be used together if desired, or you could play them one at a time. The Stadium Console is most definately a combination action controlled console. There are so many stops, you really need a combination action to control it. Both consoles on line brings the total to over 1,000 stops, 200+ pistons, completely separate combination actions, each totally independent of the other console with separate range and set pistons. Our UniFlex relay system is controlling the organ with a 266MHz Pentium II computer 64MB ram, (32MB would have worked just fine) a 4GB hard drive, and a MPU401 midi card. The Gallery organ has started. Another 12 ranks (classical division) unexpressed will begin construction and should be completed in Late August/September. We'll also be adding another 16 channels of Midi. A new blower is also going online. It will replace the 7-1/2 HP blower with another 10 HP. This will give us 2 10 HP blowers to accomodate extended unification and coupling and added wind for the Gallery organ. It's been a 4 month job getting the console rebuilt, refinished, rewired and on line, and it will be good to finally go home!!! !